The Aztecs established a lineage of emperors. Each emperor was elected from the royal lineage by a council made up of priest, warriors, and nobles. The reigns would first pass from brother to brother before they were passed to the next generation . Below is is a list of known Aztec emperors and the probable dates of their rulership. Was the first "true" emperor, and descended from the Toltecs. Was the son of Acamapichtli. Believed to had been the grandson of Acamapichtli. Under his leadership, the people serve as mercenaries to Tezozomoc, a ruthless warrior of the Tepanecs. He died in a mysterious fashion, likely by the hands of the Tepanecs. Was related to Acamapichtli. Under his leadership, the Aztecs broke with the Tepanecs. 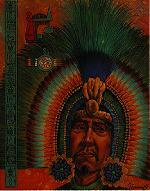 Itzcóatl's advisor was a brillant and powerful man named Tlacaelel. He suggested that all early recorded history be burned, and history be rewritten beginning at that time. 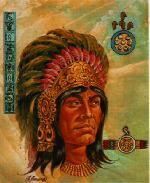 Moctezuma was Itzcóal's nephew. During his rule the Aztec empire was greatly expanded. He built botanical and zoological gardens, where every known plant and animal were collected and study. It was also during his reign, that a severe drought caused a great famine, that his people had to sell themselves to the people of Veracruz. Human Sacrifice dramattically increased and the "Flowery Wars" provided the necessary sacrificial victims. 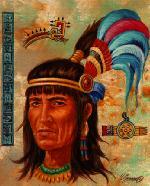 Was Moctezuma's grandson who spent most of his time reconquering lost territories and suppressing rebellions. Was Moctezuma's grandson and Axayácatl brother. He was a weak and cowardly emperor. 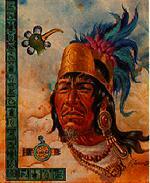 Was Moctezuma's grandson and brother of Axayácatl and Tizoc. He was an aggressive military leader who expaned Aztec territory to the Guatemalan border. The main temple at Tenochtitlán was completed during his reigh. The son of Axayácatl, great grandson of Moctezuma I. He was a powerful and knowledgable emperor, and a capable but demanding leader. Who was trained to be a emperor since birth. He transformed Tenochtitlán into an awe inspiring cultural metropolis. He was very superstitous and believed in the legend of Quetzalcóatl. He always be remembered for his surrender of Tenochtitlán to the Spanish. He Died in 1520 in the midst of a bloodly battle against the Spanish. He was Moctezuma nephew. Who only ruled for four months, died of disease brought by the Spaniards. He was the son of Ahuitzáotl, and nephew to Moctezuma and Cuitláhuach. He was the last of the Aztec emperors and the bravest of them all. He fought courageous against the Spaniards in the defense of their great city of Tenochtitlán. He died in 1524, he was hung by the Spaniards.